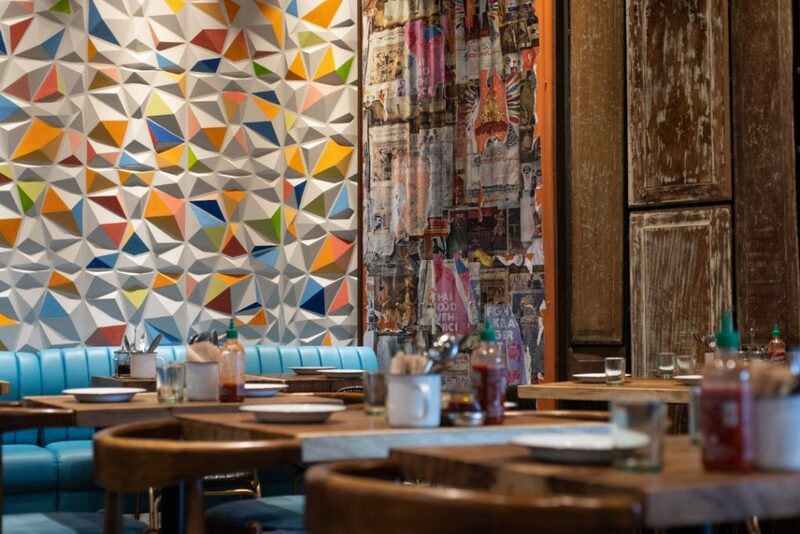 Despite the recent boom of Thai milk tea in the country, Thai restaurants have been quite a staple in the local dining scene—well, except milk teas weren’t a thing then. As early as the 1980s, restaurateur Al Purugganan recalls that Thai joints littered the streets of Manila. He should know, as he himself has been in the business for 30 years—that is of the Thai restaurant industry. After putting up two respectable establishments serving Thai cuisine—Jatujak and Tamarind—he is now onto a new idea: to make Thai food appeal to a younger market through milk tea. Well, that’s just part of it. What really did it for him was deviating from the usual setup he’s grown accustomed to in the business. This meant doing away with the usual symbolism like orchids or Buddha, or spa music, and instead opting for something unheard of in the trade. Enter Easy, Tiger. It’s this new Thai concept which started at The Corner Market food hall at The Podium and has now found its way to Uptown Bonifacio. 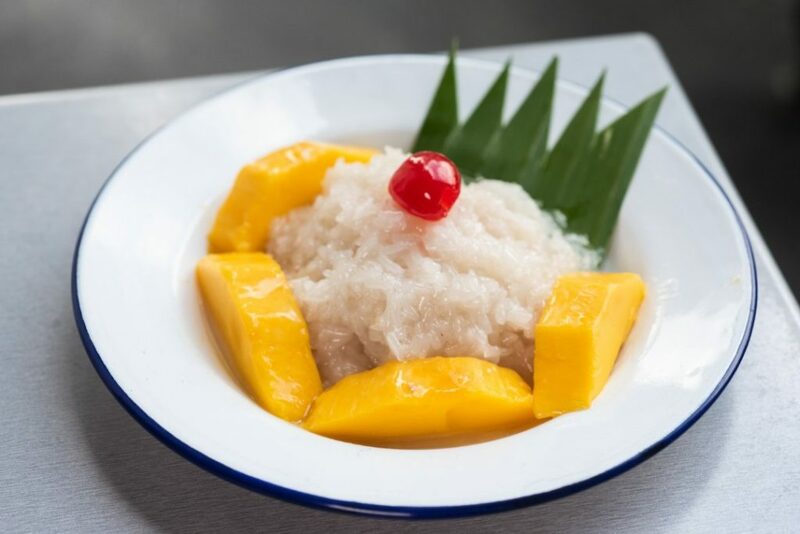 Apart from ditching the tired aesthetic, Purugganan’s Easy, Tiger also veers away from the mainstream food offerings associated with Thai cooking. 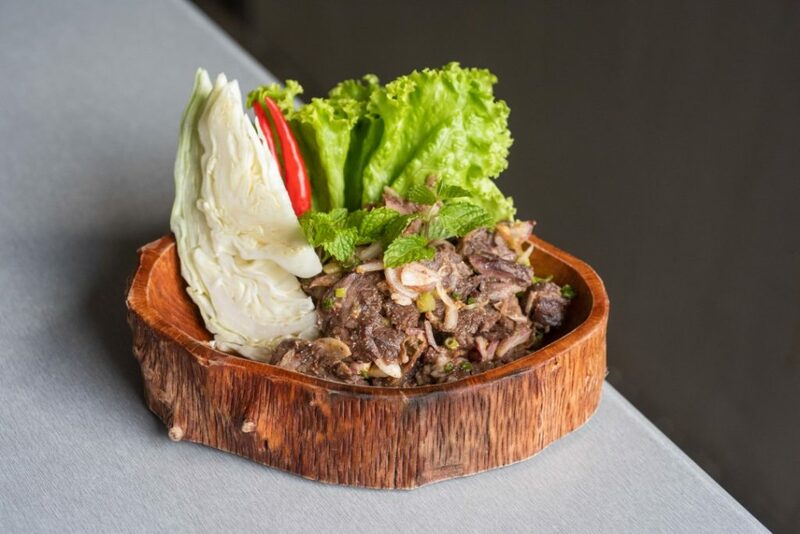 The focus is pulled towards Isan cuisine, from the country’s northern region. This is something very similar to the Filipino way of cooking. But not just that. The flavors are also quite identical: the knack for fish sauce, the use of vegetables, even the love for soup bases. 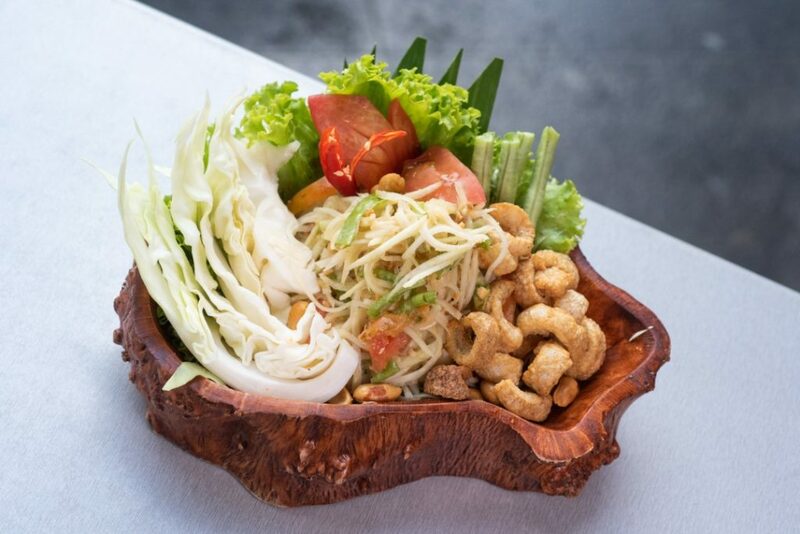 Their papaya salad (som tum moo grob) is perhaps something a Filipino would mistake for atsara (pickled papaya). But it’s fresh. And instead of a sweet acidic taste, this one is salty and spicy and has a lot of textures courtesy of peanuts and string beans. Saltiness (blame it on the fish sauce) seems to be an enduring theme in their offerings continuing on with their grilled beef salad. At one point, Purugganan had to temper the taste by squeezing calamansi. Spicy flavor is also characteristic of Easy, Tiger’s menu. 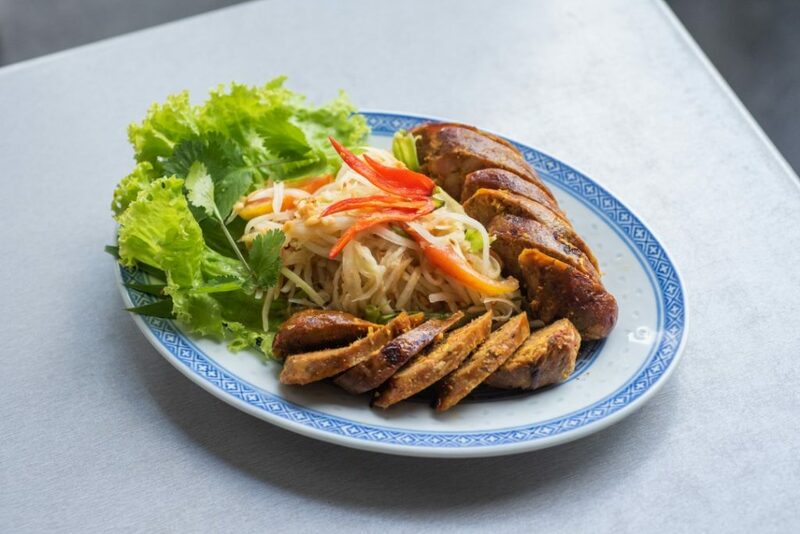 The Chiangmai sausage with galangal, kaffir lime, turmeric, ginger, and chili is perhaps the best representation of this. It’s almost as if the dish will explode with every bite. To counter this, there is a helping of sauce on the side made with milder green chili, fish sauce, and grilled eggplant. Plus, you can always order milk tea (which comes in a vegan version with coconut milk, too) to ease the burning sensation in your mouth (yes, milk is the answer and not water). 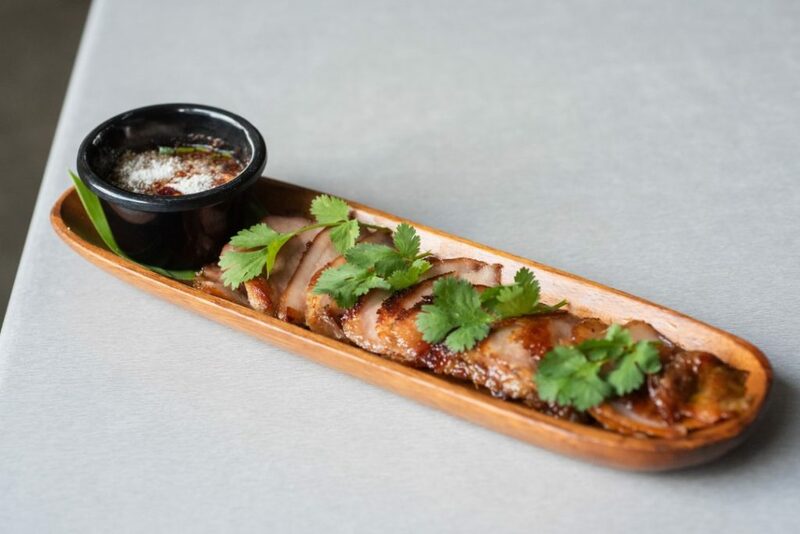 Another dish which may be familiar to a Filipino customer is the grilled pork neck (kor muu yang) which gummy texture resembles the ihaw-ihaw staple made from pork ears. It may look greasy or fatty at first but a bite will prove otherwise. It is, in fact, almost gelatinous thanks to its high collagen content. Its sharp savory flavor is complemented by a spicy soy-vinegar dip. With all these so far, one is inclined to think that Thai food is mostly spicy dishes. It is in a way a valid assumption. But it’s not just that. Apart from chili, Thai people love their herbs, something that Purugganan grew to love about the cuisine but is now becoming sort of a problem for him as sourcing proved to be difficult. Who would have thought that such an established cuisine would still face such problems decades after it first set foot in the country? Not even Purugganan with his experience, apparently. He says that while there are backyard farms who grow the likes of kaffir lime, Thai basil, and galangal, they are often expensive. So what they do is grow their own herbs whenever they can. 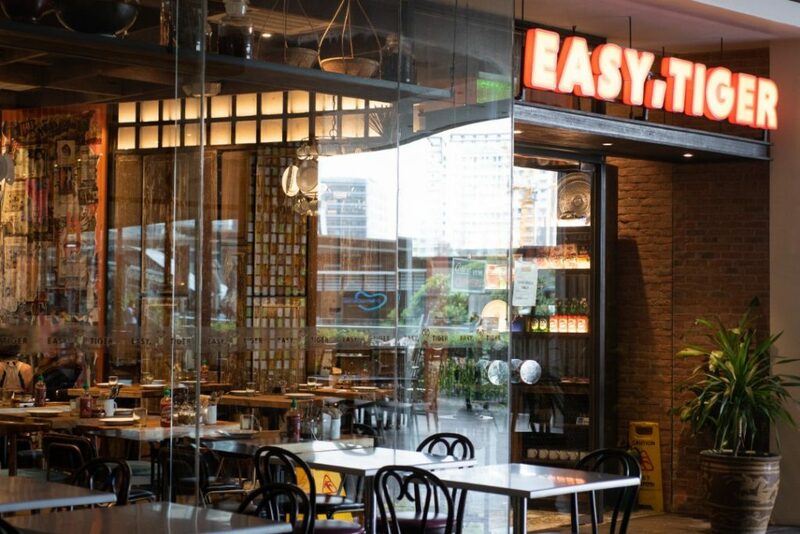 Easy, Tiger for all its effort to appeal to a younger generation (they will soon have a cocktail menu) has unlocked the formula to reintroduce Thai food to a wider Filipino market: a good milk tea (without the long queues) and a sensible menu with focus on regional cooking that’s often overshadowed by the mainstream. 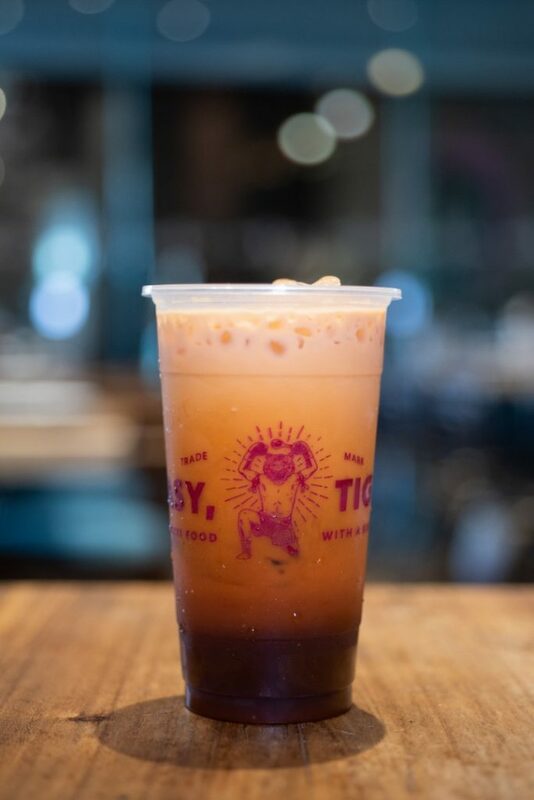 You will need a lot of milk tea here (we aren't complaining), as their food are mostly spicy, but you can adjust that, too, according to your taste.